Dating back more than four decades, the first week in October has brought the smell of roasting chiles and the beautiful, magical moving picture show of hot air balloons sailing silently through the crisp air. Hear the thrilling roar of hundreds of burners simultaneously igniting, turning the Balloon Fiesta Park into a remarkable site with hundreds of thousands of smiling, upturned faces, awestruck by the spectacular beauty of hot air balloons filling the big blue New Mexico sky. 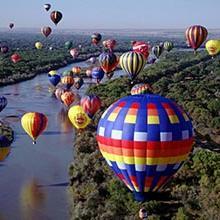 Enjoy hotel accommodations and free time in Old Town Albuquerque, exploring museums, shops and galleries. Sit front and center at the Chasers’ Club hospitality patio for two morning and evening sessions featuring Dawn Patrol and Evening Glow. Join the Michigan State Alumni Association for special access to experience the world-renowned attraction, the Albuquerque International Balloon Fiesta.